I just love hearing about couples getting engaged...don't you? Just the thought of a new marriage, a new family...and well, the wedding cake, makes me turn to mush. 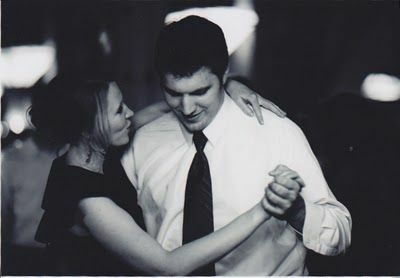 My cousin Meg got engaged last month...yay! Now, I have 9 younger cousins...just on one side of the family. Hearing about their engagements is always exciting, but this one was especially thrilling because I've actually gotten a chance to get to know her *now* fiance....and he is such GREAT GUY! ♥Meg is about 12 years younger than I am. She used to write to me in college...telling me about how she would get up before school to do "Mousercise" (Mickey Mouse jazzercise) and writing out songs she had composed....at age 7! (As I remember, there were a lot of "Ooo, baby's" in the lyrics!) I think she is the most stylish person I know! ♥Sean was the first person my son ever met who owned an iPhone. And he let him PLAY WITH IT...that promoted him to "cool" right there. He plays guitar and sings and...Sean is also a SCRABBLE Champion. And that's where the cookies come in. My original thought (a year and a half ago when I met Sean and had a feeling this day was coming) was to make a cookie Scrabble board. 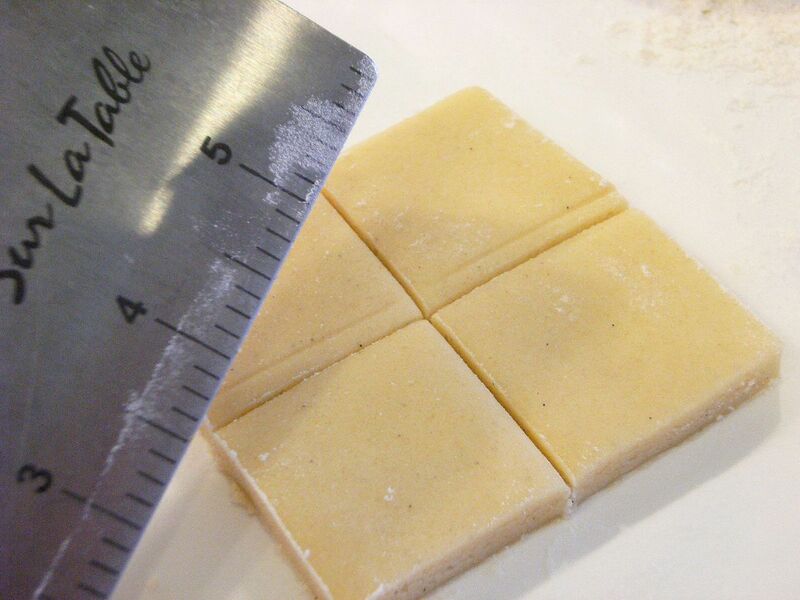 Unfortunately, I just couldn't get it to look quite right, so I made Scrabble cookie tiles. 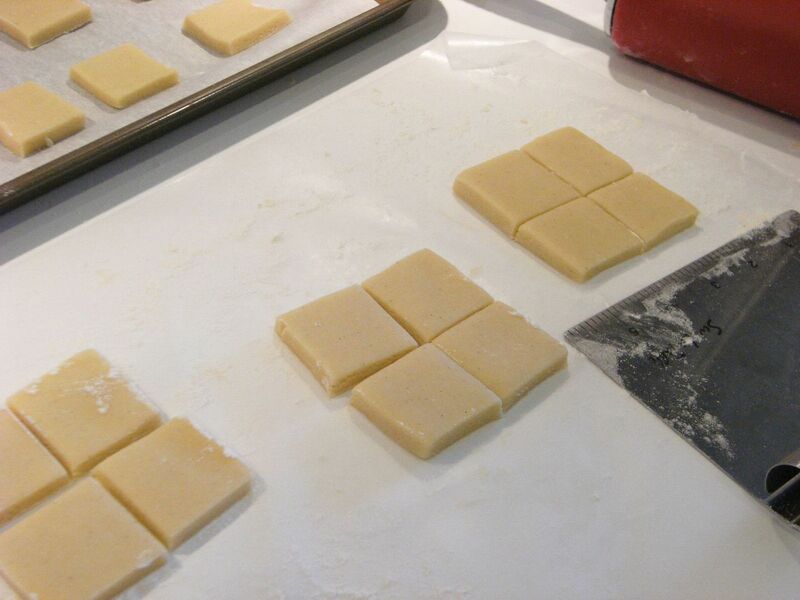 Using my bench scraper, I divided square cookies into fourths. I jazzed up my usual cookie recipe with 3/4 tsp vanilla bean paste in place of the 1/2 tsp vanilla extract. Since they were smaller, I cut the baking time down by 2 minutes. 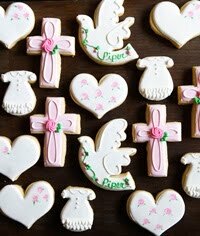 ♥Outline each cookie with a #2 tip in ivory (AmeriColor Ivory). 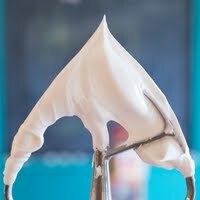 ♥Thin the royal icing with water, stirring in a teaspoon at a time until it is the consistency of a thick syrup. 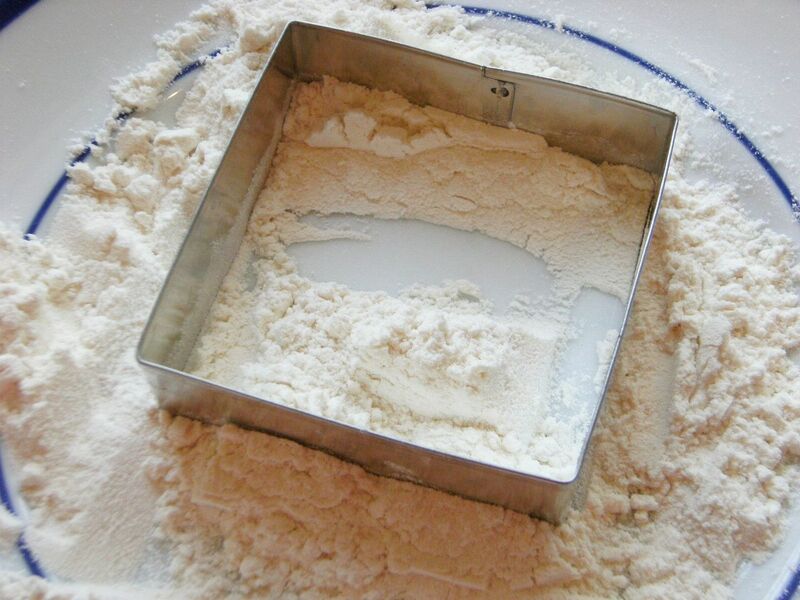 Cover with a damp dish towel and let sit for several minutes. ♥Stir gently with a rubber spatula to pop any air bubbles that have formed on the top and transfer to a squeeze bottle. 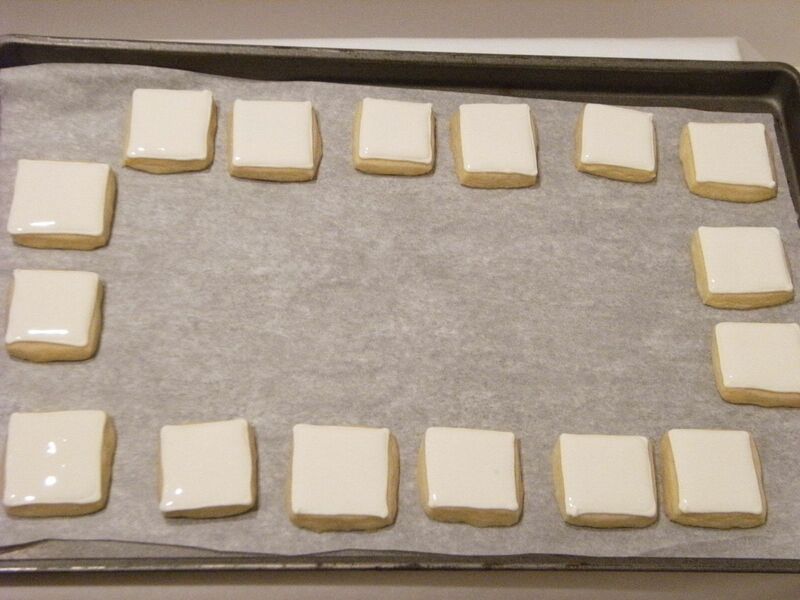 ♥Fill in the cookies with the thinned icing. Use a toothpick to guide into the corners. ♥Let sit for at least 1 hour. ♥Using a #2 tip pipe the letters in black icing (AmeriColor Super Black). ♥Switch to a #1 tip and add the point value for the letters in the corners. 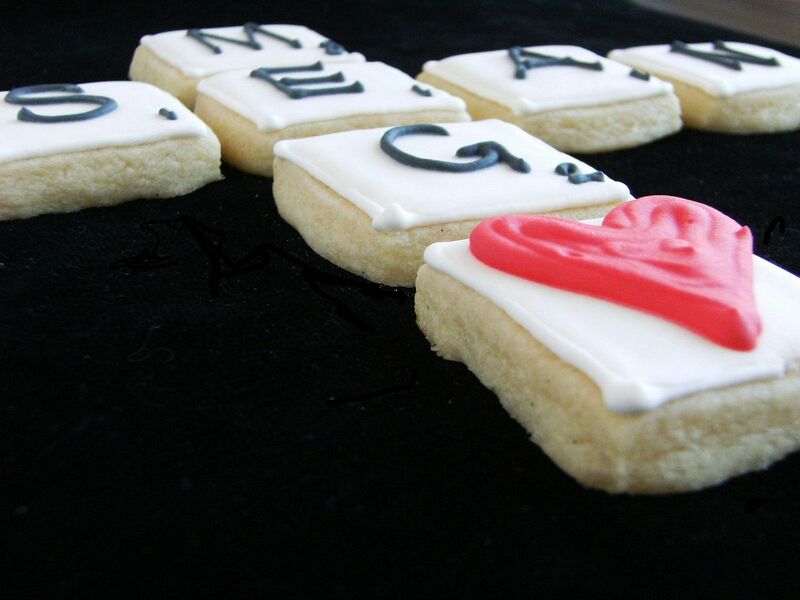 ♥With red icing and a #3 tip, pipe hearts on several of the cookies. ♥Let dry overnight and package. Congratulations & best wishes Meg & Sean! Here's to a ♥sweet♥ life together! Cheers! Wow! You're good! We need to come here for cookie decorating tips. This is a great gift idea. So clever.....What a great idea. I LOVE this idea! All 5 of our family's names fit together "scrabble style", so I'm going to make this up for our VDay dinner! What a great idea! I love Scrabble! I'm totally going to remember this and use it someday. Oh my word, the sight of the bag filled with the tile cookies made me "AWWWWWW, How ADORABLE!!!" out loud. What a supercute idea!!!! Love it!!! Bridget, my heart is totally melting! This is so adorable, and it really hits home for me. My boyfriend and I have been dating long-distance for over a year and we often take to playing Scrabble against each other online. Congratulations to Meg and Sean! Once again you've done it! So clever and darling! I've got to do this for someone! this is an absolutely adorable idea ! :] i love it! I might actually try and do this for my boyfriend for valentine's day! Thank you for your awesome ideas and tips. What a cool post. And adorable cookies! Wish I'd been here to grab a few. Would you PLEASE stop AMAZING me all the time!!! Can you just ONCE feature something that just makes me say..."oh...that's nice!" You just insist on blowing my PINK mind everytime I pop over! those scrabble letters...oh and the heart...ONLY YOU!!!! Write and publish...and I MEAN IT! 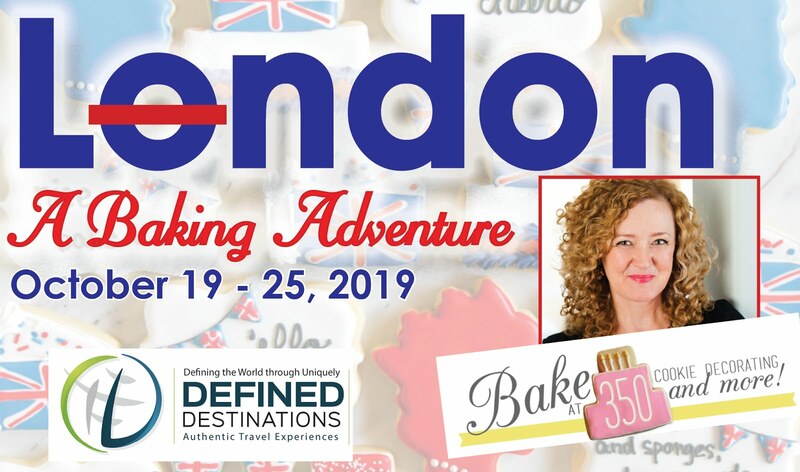 Do you know how fast I would race to the baking/recipe book section in Barnes and Nobles if I spotted the looks of your Bake at 350 pink button on the cover of a book?! Why I'd practically about KILL myself getting to it...and I'd buy it FOR SURE!!!! Oh...you ask...WHY do I always type BRIDGET twice each time I pop over...well it all has to do with the AMAZEMENT factor! When you're AMAZED at someone...you can't just say their name once!!! Oh...and just so you know sweet girl...you are NEVER too late for my party! XXOOXXX...it was a pleasure to see that you had popped over to Bainbridge. Thinking about your sweet dear Marge! And today I saw Kelly Rippa (is that her last name?) on tv...and I just thought...WOW...she gets to meet BRIDGET! 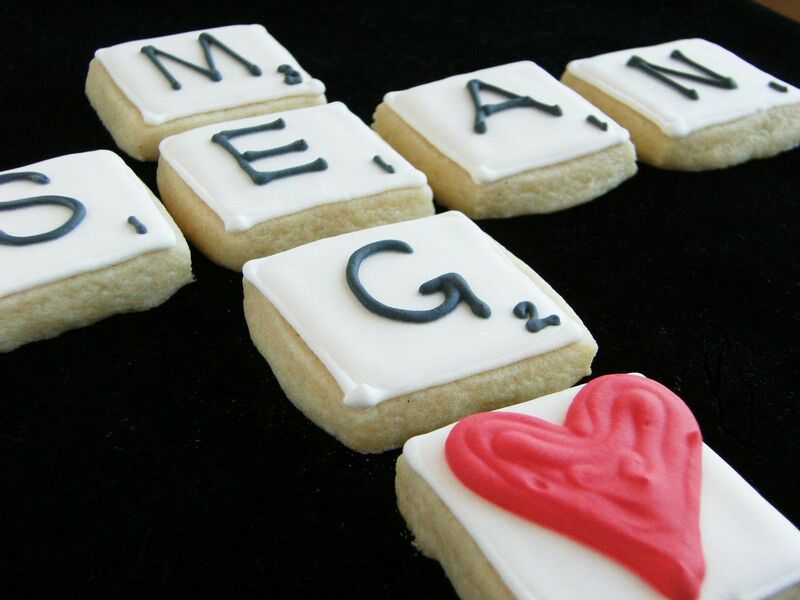 these "scrabble" cookies are awesome! you are so talented...thanks for the techniques photos...very helpful! can you give us all the info for the nyc event w/kelly please? Very cool! Best of luck to your cousin dna soon to be cousin-in-law! OMG...i love the engagement cookies...they look delicious and are so sweet! BTW...they are a cute couple!! Love engagement stories - and those cookies - too adorable! It blows my mind how creative you are. Each time I think you have the cutest thing, your next post tops it! I'm in awe. So fun! Right down to the packaging - another great idea! Thanks for sharing. O-and seriously, would you introduce me to Teresa? That girl is a hoot. but really YOU are so GREAT! Those are so cute I almost can't stand it!!! If you ever come to Memorial (or my husband is downtown), I want to order some!!! I love your stuff!! Yes ... this is a darling v-day gift idea ... that I will totally be copying - THANK YOU!!!! When you leave your cookies overnight to dry, do they soften? Or are they meant to be soft and not super crunchy? These are darling!!!!!!!! What a cute idea. what a great idea! 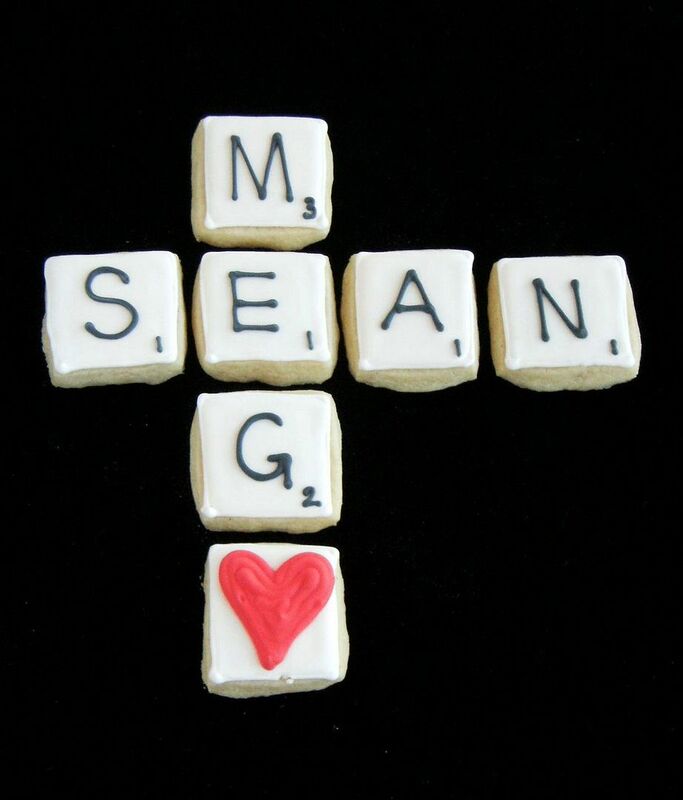 I'm doing a wedding cake for a scrabble lover later this summer...maybe I should incorporate this into the design! congratulations to your cousin meg and fiance sean! what a great engagement gift! This is an awesome idea!!! I absolutely love it! It's creative and adorable! They must be extremely happy with the finished product. my boyfriend and I are constantly entrenched in heated games of Scrabble -- on the physical board or in online games. thankfully both our names have at least an 'a' in them, and i love to bake, so this is perfect for our next anniversary. thanks for such a whimsical idea! I love these, and they are perfect for valentine's day!! I used to rent Mousercise all the time from the library as a kid. So fun! Haha. I'd like to thank you for giving me the PERFECT inspiration for my husband's upcoming board-game themed birthday party desserts. Yay! He adores Scrabble, and these are just what I need! you are too clever!! these are so cute! These cookies tasted as good as they looked! Sean and I LOVED them. He was impressed that you had the correct Scrabble point values on the letters, too. Thanks, Bridget. What a sweet post! These cookies and post are cute, cute, cute! We are out of school today. I may just have to try this. Oh my goodness....what a CLEVER idea!!! SOOO cute! Love this idea for Valentine's day! omg these are so freaking cute!! You are SO clever!! These are totally adorable! I've died and gone to heaven. 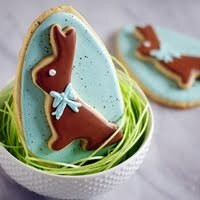 Those are the cutest cookie ever! Love love love those cookies. SO cute! These cookies are so cute!!! Wow! Great job!! Congrats to the new couple! My fellow is going to love these! HIs birthday is next week and he loooves scrabble!!! Thanks for the wonderful post! Too cute! makes me want to go and bake for vday. I love this idea! So original and special. Oh WOW! These are so cute! I just clicked over from Craft Gossip and I'm so glad I did. I'll be linking to this if you don't mind. And subscribing so I don't miss a thing! What a great idea. My sister and I play "wordscraper" aka scrabble on FB on a daily basis. 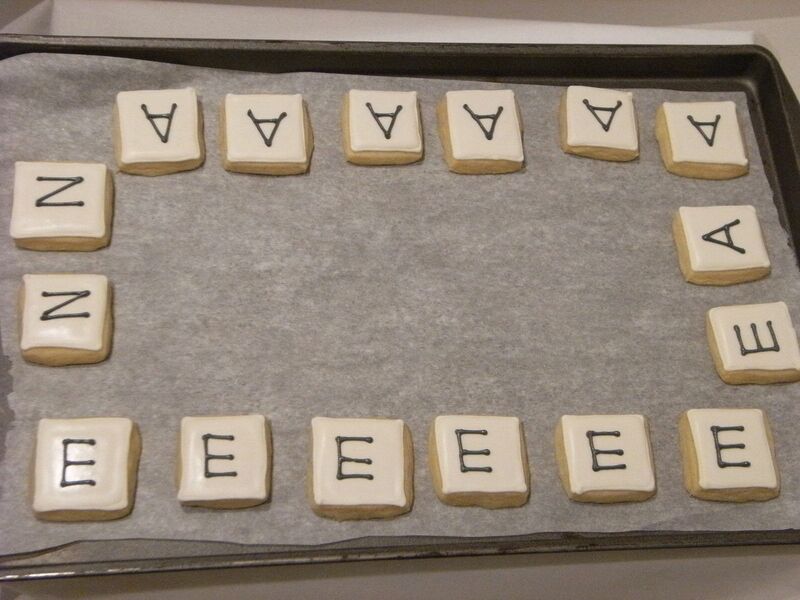 She is addicted to Scrabble and would love these cookies. Where can I find your cookie recipe? 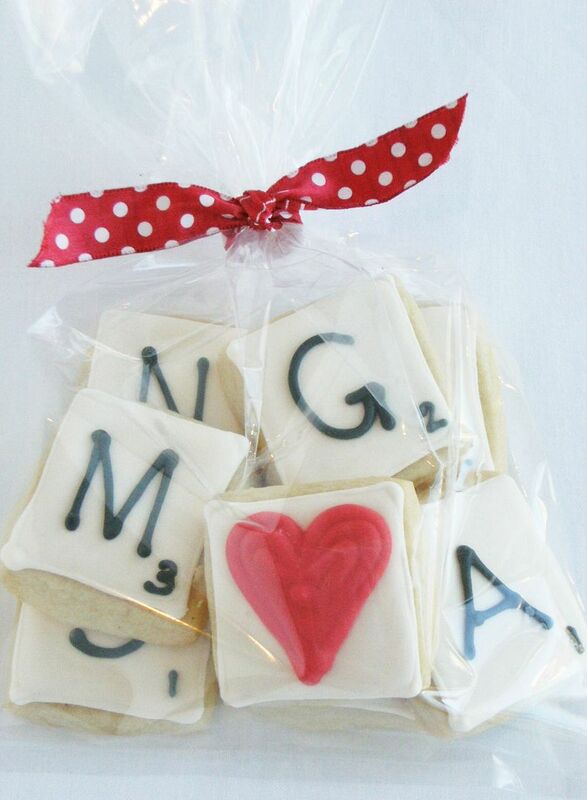 I have made initial cookies as a bridal shower favor using the "monogram" initials. But when royal icing is involved, it takes it to a whole new level! These are great! 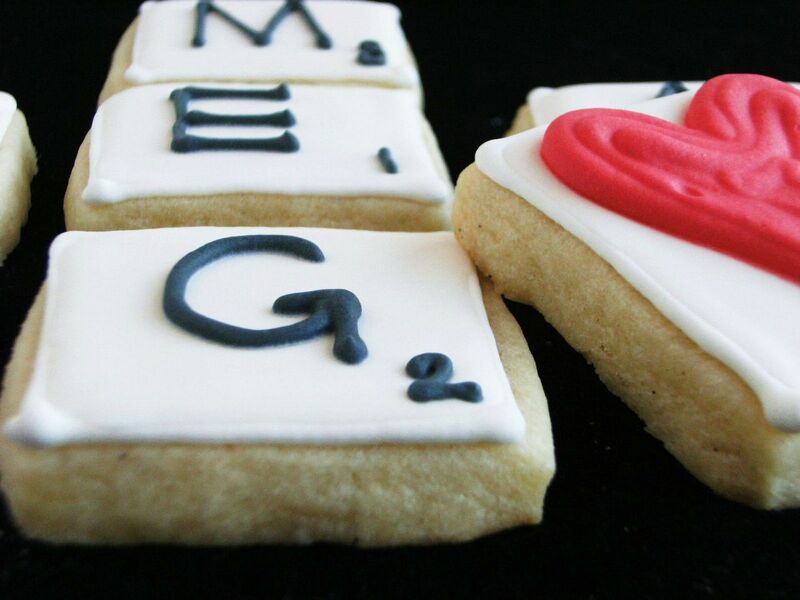 I love cookies, and I love Scrabble! Unfortunately, no one loves playing Scrabble with me due to my insistence that I be allowed to use Latin words. Those are the most darling things I have ever seen!! These are so absolutely positively ADORABLE, Bridget! My boyfriend and I were looking at these the other night and at the same time we both said..."SCRABBLE PIECES!!! Cool!!!" I love them! I just found your site and I love it. You have great food, cookies, and sweets. Just what I like! Your cookies have inspired me! I am going to attempt the royal icing and flooding. I'm even looking for new cookie cutters!! I'm going to start with Valentine's Day though. Can you tell me where you get the cello bags and what sizes they are?? I live in PODUNK so need to buy online. Thanks!! Oh, these are so stinkin cute. I'll definately be posting about them as an addition to my "romantic scrabble" date night post. Thanks for sharing--love them! I order the 6x10" bags, which are large enough to hold most all of my cookies, even though they are a little roomy for a 3" or smaller cookie. LOVE LOVE LOVE this. my husband and i are scrabble fanatics. Thanks for this. this is a nex concept. Love your idea of making it as a scrabble pieces. I just LOVE, LOVE, LOVE these cookies. So sweet and you did a wonderful job making them. 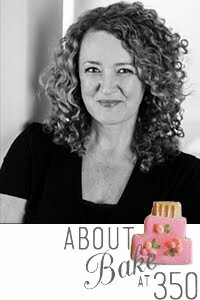 You're an awesome cookie decorator Bridget along with being a super blog writer! I always enjoy your posts! THIS is complete GENIUS!! How perfect! Love these scrabble letters and want to have them ready for a future event-Can you give any pointers on freezing these for future use. Should I complete all frosting steps-or just stop after the white. I'm afraid the letters will pop off or bleed into the white after they thaw. Any experience you can share? 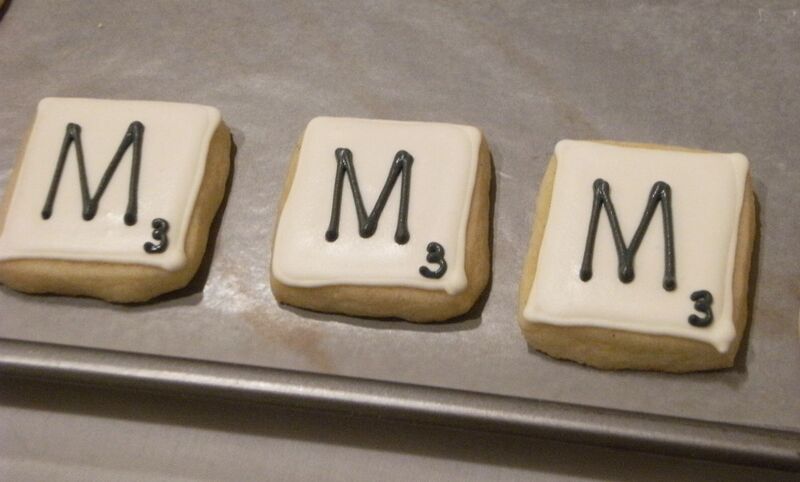 I love these scrabble cookies-any pointers are preparing them ahead of time and freezing for a future use. Should I complete all steps or just frost the white and leave letters/numbers for later. I'm afraid the letters will pop off or bleed into the white after they thaw. Any pointers or experience with freezing these? Roni....yes, you can make and decorate the cookies ahead of time. I would place the cookies in a big ziploc freezer bag, then put that in a freezer plastic container to keep them from getting crushed. Just thaw at room temp in the packaging for several hours. OMG, seriously? Are you kidding me? These are BEYOND cute!!!!!!! Thanks for the thorough pics and tutorial!!!! I'm tagging your blog to follow for SURE!!!! wierd material and I am into the website however what about the ugly issue of collusion in online poker? 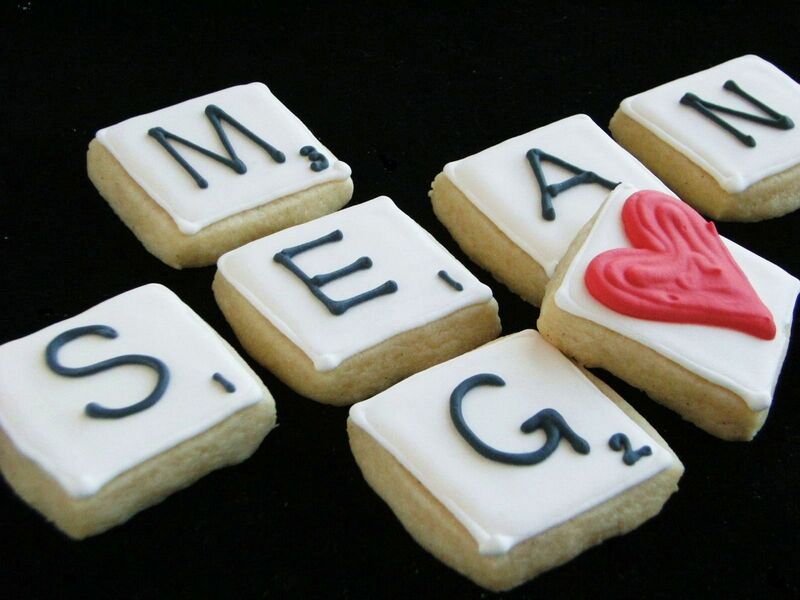 I love making crafts with Scrabble tiles and found your cookies and fell in love ! Thanks for the idea! My sister is making the Scrabble cookies to spell "B A B Y" and the point values will be 9,26,11 (she's due 9/26/11). My grammy is a Scrabble fanatic and my sister is announcing her second baby tomorrow. I will try to snap some pics. Thanks for the great ideas and excellent instructions! My husband proposed to me in a game of scrabble so these would be perfect for us! What a great idea - they look wonderful :) I'm enjoying your blog! I love these cookies. We love playing games and my SO especially love Scrabble. I can't wait to make them. We are planning out wedding, maybe I will incorporate them into the plans. Thank you. 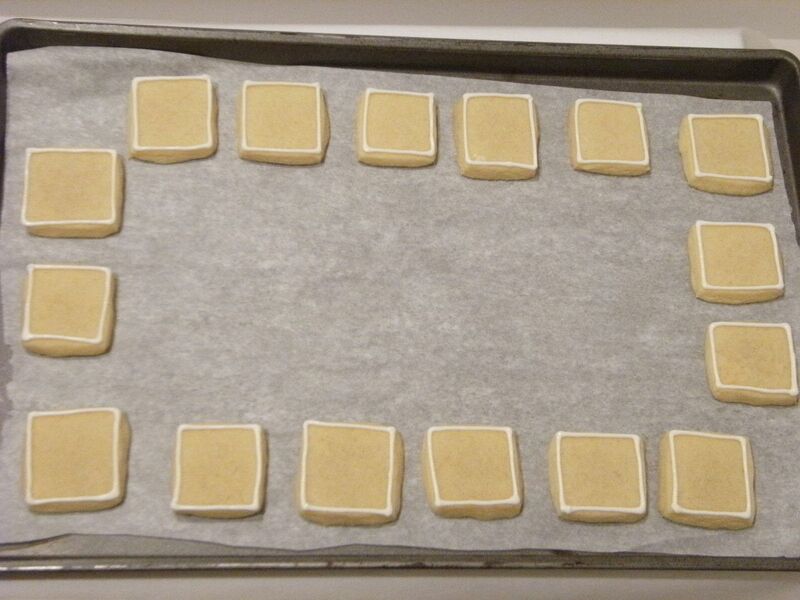 I juste made your scabble biscuits last week for my daughter's birthday. The kids have had a lot of fun trying to make their own names with the biscuits! Thanks for this idea! Made these last week for my boyfriend's birthday. I have pictures of the one's I made on my blog and mentioned your blog as inspiration. Hi Bridget, these are so adorable and just perfect for me and my husband because our names are Meg and Sean. 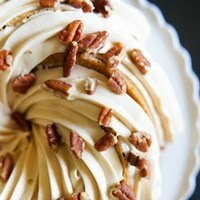 wish I could have had these at our wedding last year, but these are just simply divine! Also, thank you for writing the blog, it's so amazingly inspiring! Love the scrabble letter idea! 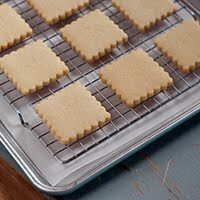 I have been making cookies with black accents but I am having trouble with the black bleeding into the color beneath. In this post you didn't seem to have to wait very long before adding the black accent. Did you ever have trouble with bleeding? Would really be helpful if you could help me out! i love your blog..me and my partner also do love playing scrabble..we usually play during our free time..its our way also of spending with each other specially if we are both busy.. 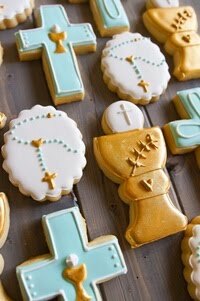 I'm getting married in December and am making these cookies this weekend to ask my bridesmaids!! I'm just gonna write "bridesmaid?"/"maid-of-honor?" on them and have them figure out the puzzle:) Thanks for the wonderful idea!! Ask for your pictures and good information.